Update: It’s been flown, 5 flights total. The setup seems sound enough and the plane is extremely responsive. Low rates became high rates after some hefty tweaking on the radio. The rudder response is really out of this world. I cna’t belive the canalizer does all that but if it does, I don’t really see much point in having it, it’s just so responsive that I have to learn to fly all over again. For winter practice and general fooling around: A new toy. The Kyosho Osmose is a wonderful little ARF and was just too tempting after I crashed my Mini Scalar last summer when the motor cable disconnected in flight and I had all that expensive equipment lying around. The Osmose is powered by a Kontronik Kora 20-14 outrunner and Jive 60LV ESC. Batteries are 5S 5000mah so that it can be powered by “half-packs” should I ever get around to going electric in my 2-meter models that would use 10S LiPos. 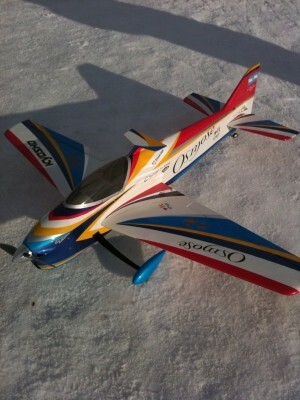 Servos are Futaba 9650 on ailerons and some Graupner DS8011’s I had lying around for elevator and rudder. A Fubata 6008 Fasst receiver and a small GP AAA 850mAh receiver battery is used as a BEC-backup. This entry was written by Jon Gunnar Wold, posted on February 27, 2010 at 23:31, filed under electric, My planes and tagged electric, Kontronik, Kyosho Osmose. Bookmark the permalink. Follow any comments here with the RSS feed for this post. Post a comment or leave a trackback: Trackback URL.